Place 1/3 cup extra-virgin olive oil, wine, vinegar, and oregano in a large Ziploc bag or bowl. Mix Well. 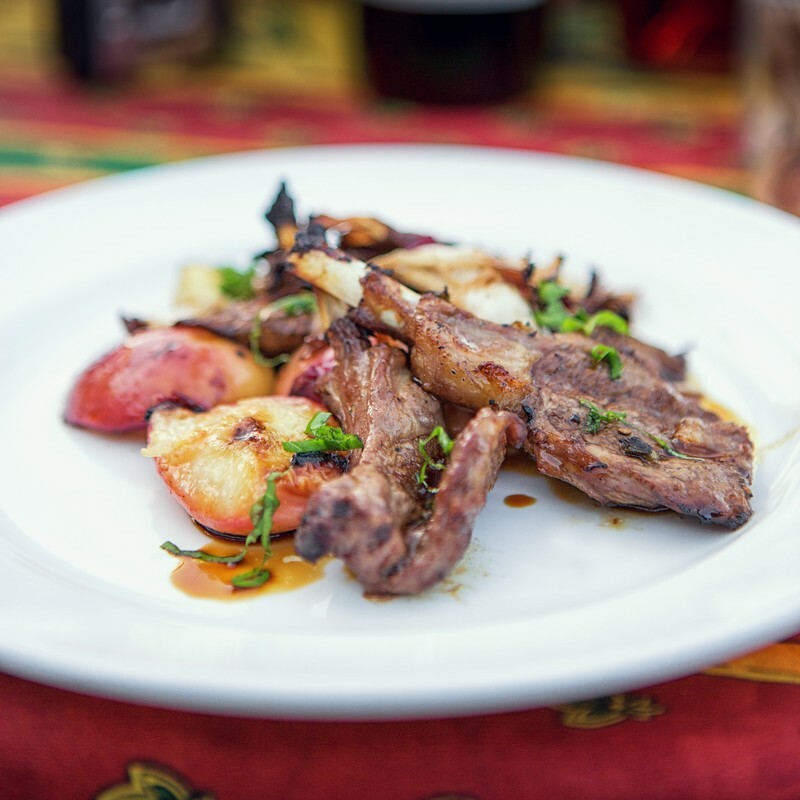 Add lamb chops to marinade for 30-60 minutes. Place the radicchio and fennel pieces in a large Ziploc bag and toss with honey and remaining 1/3 cup of olive oil. Heat grill and place the lamb, fennel and radicchio on grill. Grill the lamb until medium rare, about 5-7 minutes each side. Grill the fennel and radicchio on both until the radicchio is slightly wilted and the fennel is softened. Remove from the grill. Chop the fennel and radicchio and toss with balsamic vinegar. Serve the lamb on top of the chopped grilled veggie salad. 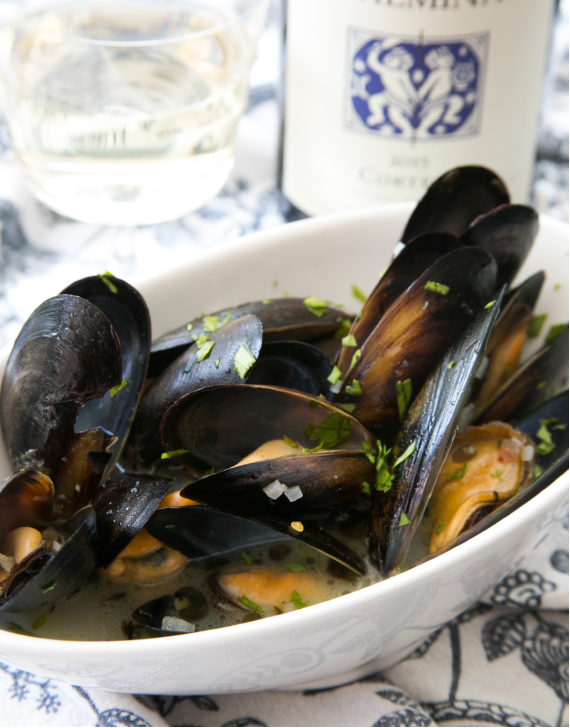 Enjoy with a glass of Palmina Nebbiolo Rocca! Harvest this year was the best we have seen in at least the last 5 to 6 years! Beautiful fruit! All of the amazing reasons that brought me to Santa Barbara County to make wine were in full bloom and easily identifiable. Cold nights and moderate days allowed the fruit to retain its own marvelous acidity, the hallmark of our region. Our new production facility was put to its first real test and performed admirably! Efficiency and proximity allowed for one of the most focused and successful harvests I have ever been involved in. A big salute is in order for our Assistant Winemaker Javier Franco for organizing and executing a fantastic vintage in a brand new facility. As we lovingly labored through a constant barrage of grapes, inspiration came in the news that our Vermentino was to be served at the final State Dinner at the White House for the current administration. It has been an immense honor for Palmina to “bookend” this administration by being used as a gift in 2009 to then Italian President Napolitano at President Obama’s first G8 summit in Rome, and then again at the final State Dinner for Prime Minister Matteo Renzi in October. But alas, now our attention turns again to one of our favorite times of the year! With the Holidays coming fast, it is time for… NEBBIOLO!!! We will be celebrating our favorite grape over the month of November with the release of our 2009 vintage of Vineyard Designates. Please stop by to try the incredible variety of flavors and aromas this wine provides. With Halloween behind us, it is time for that most American of holidays, Thanksgiving! It is our sincere desire that this year you celebrate this most indigenous celebration with indigenous food and wine. And nothing goes better with turkey than Nebbiolo! We have whites to start your celebration, Rosé to continue and Nebbiolo to serve alongside your main course. As always, we are humbled by your continued support and look forward to seeing you over the holidays! I’ll be making pizza at our Red, White and Green Party on December 17th, and would love to see you there. All our best to you and your family and friends over this Holiday Season! Welcome your guests this addictively delicious appetizer. Skip the arugula portion of the recipe and arrange with toothpicks on small dishes. A truly California-style classic dish. Organic arugula and beets alongside walnuts keep it feeling perfectly fall-like. We love our asparagus in California, and we have found there is no better wine to pair than Tocai Fruilano! This soup will warm the hearts and bellies of everyone at the table. Lend a nutty twist to the traditional risotto. This comforting and tummy-warming dish is sure to please turkey lovers and vegetarians alike. 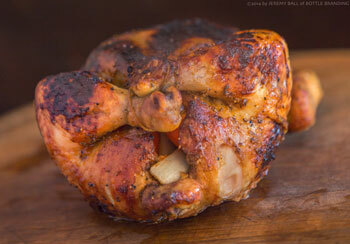 Orange slices keep it juicy and tender while the onions and rub give just the right amount of flavor and spice. 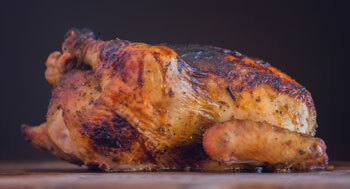 This is your new Thanksgiving turkey recipe! Find these recipes and more mouthwatering dishes in our recipes area. 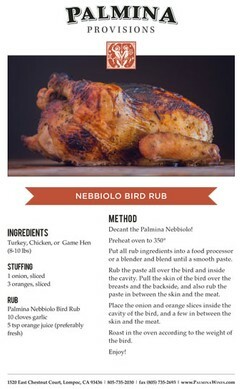 Also check out our Palmina Provisions line, including our famous Nebbiolo Bird Rub and variety of olive oils. Loved what you saw? Stay tuned for our Christmas menu and gift ideas coming in December! From all of us here at Palmina, have a safe and wonderful Thanksgiving. Salute. Every year here at Palmina we celebrate our favorite noble grape of Italy, the notoriously testy but undoubtedly lovable Nebbiolo. Exhibiting a stunning range of flavor profiles, from a powerful, muscular king to a sophisticated, elegant queen, Nebbiolo can stop even the most seasoned wine drinker in their tracks. It’s both cerebral and visceral at the same time, one to contemplate and one to wildly enjoy. The exact origin of Nebbiolo is debated in wine circles, whether it hailed from the Piemonte of Northwest Italy or from Lombardy in the central North. In either case, it was lauded by the famous Pliny the Elder in the 1st century, and by the 11th century was the official court wine of the House of Savoy, rulers of the Piemonte for over 800 years. It is no wonder Barolo became known as “The King of Wines, the Wine of Kings!” Tragedy struck in the 19th century, when phylloxera decimated Nebbiolo, and as a result other varietals like Barbera and Dolcetto took over the reign of Piemonte. Today, Nebbiolo is only grown in about 6% of the Piemonte, but keeps its regal reputation with the classification DOCG in Barolo, Barbaresco, Gattinara, Roero, and Ghemme. Factoid: It’s also an allowed grape in the delicious bubbly wines of Franciacorta. The name “Nebbiolo” is also debated, with the majority of wine lovers understanding it deriving from the Italian word “nebbia”, which means fog and refers to the dense layer that accumulates in the vineyard around harvest. Others argue it harkens to the fog-like appearance of the grape as it matures, while still others state it derives from the word nobile, or “noble.” We love to argue stuff in the wine business, don’t we? 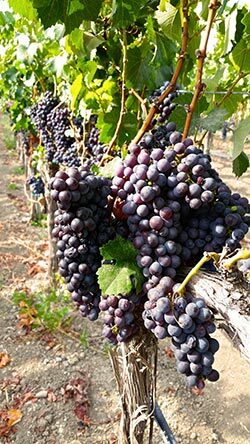 Here in California, Nebbiolo, along with other native varietals were the first European varietals planted. Arriving on the backs of Italian immigrants in the 19th century, Nebbiolo was first planted in 1802. Steve Clifton and Palmina first started working with the noble grape in 1997, and those of you who have been with us since the beginning, know the incredible wines these vines have given us over the years! Sisquoc: The tenor. The rowdy rebel. Tannic and forward. Notes of bright cherry, orange peel, brambly raspberry, cedar, and rocky minerality. Honea: The soprano. Gorgeous, elegant, and sophisticated. Mellifluous notes of rose petals, tea leaves, cherry, herbs, beautifully integrated tannin, and a leather whip. Rocca: The baritone. The muscle and the structure. Deep, dark and brooding, with notes of dark cherry and plum, tar, tobacco, smoke, and black truffle. Try each of these individually and together in our SBC (Santa Barbara County) Nebbiolo blend. ALL ON SALE NOW to honor Nebbiolo Month. a bunch of grapes as if it had nothing else in the universe to do." LD: Were you shocked at how early fruit was coming in? CC: This is absolutely the earliest time we've ever had harvest happen. It's undeniably the craziest thing to see fruit ripe and ready in July. Last year, the first week of August was the earliest. So to be in this area (Santa Barbara county) producing wine for over 20 years combined between Palmina and other places, we've never seen it coming this early. LD: Were there early signs it was coming faster? CC: Definitely, when we took our staff vineyard tour in early part of July the visible difference of fruit maturity was absolutely shocking. We had never seen the veraison and coloration of Pinot Grigio be that advanced in July. That first week of the month was when we completely understood that this was going to be the earliest harvest ever. LD: What do you believe are the top causes of the early harvest this year? CC: I think that it addresses the overall concern we have about the changing nature of our weather. The weather patterns have not been stabilized or been 'regular' for many years now. We did not have any cold nights and we had a very mild winter. Traditionally we have a swing of up to 30 to 40 degrees a day in our temperatures, meaning that it can go up to 80 degrees and down to 40 degrees at night. So, with that said, we usually have a very long growing season because it's so cold at night. When the weather stays so warm during the night the plants continue to work towards maturation, making fruit ripe early. LD: How did it affect numbers/yields? CC: The yields were really affected not so much from heat, but the effects of not having any rain were disturbing. 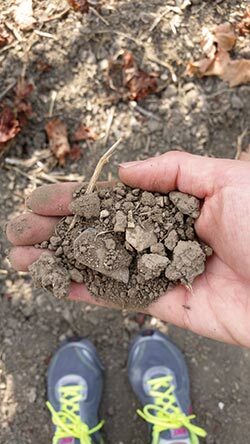 What happens after many years of no rain is you have a mineral buildup in the soil and when the soils get this kind of deposit, all these minerals build up around the root system. When you don't have any really heavy rains to flush it away, they're not able to really gather the nutrients and produce as much fruit as they're called to do. Therefore, they really struggle and this year we got across the board about 30% to 40% of what we typically get in a "normal" vintage. 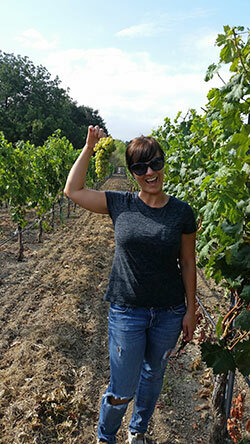 LD: What should wine drinkers know about this harvest (for Palmina and in general for Santa Barbara county)? CC: You know it's really about enjoying the limited wines that will be coming out for 2015. We don't have a lot of grapes, so really it's about appreciating what the vintage gives you and recognizing that the quality is still there.